Case Management – CareDirector is an off the shelf solution that can be easily adapted to reflect your own case practice, system and administrative needs. Instant access to information and interactive views of program operations including built in assessments for eligibility. Collaborate and Share Appropriate Data with other agencies. CareDirector’s modular design of case management that allows them to design a system that can have separate modules for areas of practice like the Hotline, Prevention Services, AFCARS reporting etc. Providers – Within Providers CareDirector allows you to quickly capture provider services, incident reports, service authorizations, counties served, staff and programs. CareDirector’s Provider Portal enables providers to view and maintain their own organizational information within CareDirector, with optional agency oversight and approval. Agency staff control individual provider staff access, and overall view or view/edit access to the provider detail available on the Portal. Providers may also view their active service authorizations, upload documents and files, and communicate with the agency. Consumers – Consumers can set and cancel appointments like court hearings, complete agency driven self-assessments, review their enrollments in services and file appeals or complaints and search for resources. CareDirector’s consumer portal empowers clients and their families or guardians. 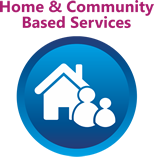 The Consumer Portal includes the same resource search and advocacy features as the Resource Directory allowing agencies to determine the information available and the level of access granted. Financial Management – CareDirector can handle financial integration for both payments and billing. Rates can be set at the person, funder and provider level. Invoices can be captured via case notes, service deliveries mass entry and daily service interactions. Service authorizations link case plans to the provider, person, funder or service by date frame, unit of measure or frequency. Intake Hotline – In CareDirector, reports or referrals of suspected child abuse or neglect are generally completed by Child Protective Services Intake staff. Staff can initiate and document reporter information, conduct screening interviews with callers, use statutory and agency criteria along with built-in structured decision making (SDMss) tools to determine acceptance of a maltreatment report for further investigation or assessment. Response priority times can be determined for screened in calls and reports that do not meet criteria can be screened out and/or referred to other services. Mobile – As part of CareDirector’s modular platform, we offer the stand-alone CareDirector Connect mobile application. CareDirector Connect provides full case management capability securely in the field on any Windows, IOS or Android device. CareDirector Connect can easily integrate with an agency’s existing health and human service system or it can be part of an entirely new technology modernization initiative as agencies replace old systems with CareDirector’s comprehensive platform. Integration – CareDirector, on Microsoft Dynamics, is the only health and human services case management solution that offers full integration to all systems. CareDirector’s flexible human services solution has a capability, unique among health and human services solutions, to be locally customized, configured and extended via integrations and interfaces to other systems and services. Dashboards & Reports – The reporting tools in CareDirector provide child welfare workers with an integrated view of operational as well as analytical reports giving the staff visibility into critical decision support information. Additionally, CareDirector provides support for ad-hoc reporting where pre-defined reports do not meet the requirement. Data Exchange – CareDirector has an open architecture designed to allow data sharing between systems that were previously silos. Integration components allows bidirectional information exchange between local, state and federal organizations. 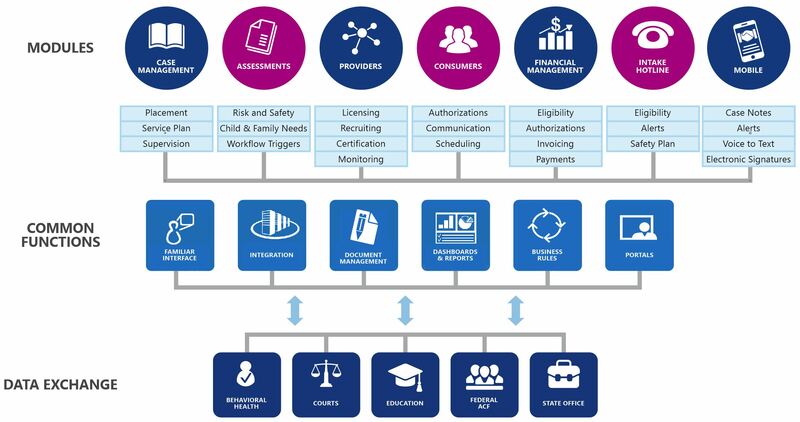 CareDirector’s platform offers a menu of interoperable modular options as shown in the diagram above including case management, finance, client/consumer and provider portals, and a standalone mobile app, CareDirector Connect. Our solution is highly flexible and entirely reportable with the ability to integrate and interface with other internal and external applications. With CareDirector, comprehensive client, case and agency information are just a click away. Reminders and alerts are automated – and auditable, enabling workers, supervisors and managers to do their jobs more easily and efficiently. Best of all, the CareDirector Connect mobile application provides full case management capability securely in the field on any Windows, IOS or Android device. Provides instant access to information and interactive views of program operations. Streamlines processes and improves communication and collaboration to enable efficient staff and resource management. Improves agency performance through use of actionable information. Supports data-driven decision making through built-in reporting to help deliver high-quality services that improve outcomes for families and children. Works the same way as the email, calendar and office systems that staff use every day. Tracks eligibility, ensures foster care providers are fully licensed and communicates with stakeholders to ensure accurate payments. Is a flexible COTs based on Microsoft enterprise technologies that is cloud deployed to meet agency needs. Is scalable to fit large and small Child Welfare agencies and to support specific functions within a single Child Welfare service. Delivers value quickly and can be easily adapted to meet emerging business and practice. Has an open architecture designed to allow protected data sharing between separate systems that were previously silos. Is easy to use, flexible and accessible on PCs, laptops, tablets and smartphones. Reduces time spent on manual documentation, paperwork and juggling information from multiple sources or data systems. Allows for more time spent on working directly with children and families to improve safety, permanency and well-being outcomes. Provides ability to pre-populate information already in the system for ease of recording information and completing assessments and case plans. Contains powerful user dashboards that can be easily designed and used to manage daily work. Manages all communication between all parties involved in cases; creating, accessing, filing and archiving emails, letters, voice mails and chats.